Any tree growing near a building or a fence will be removed safely by sectional dismantling while using tree gear and arborist techniques. We can fell trees from the ground without the necessity of progressive lowering of branches and parts of the tree trunk. Our services include pruning trees in gardens, parks and alleys. 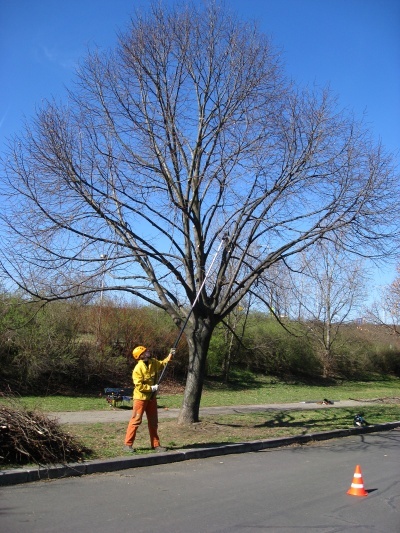 We remove dead and damaged branches; we reduce tree crowns growing above roofs of different kinds of buildings. Thank you for choosing STROMOLEZEC for your FREE ESTIMATE. The price is based either on our inspection at your property or on photographs you send us. Thank you for contacting us and making an appointment for our visit. In order to make our proposal as precise as possible we prefer to inspect the property in person as the photographs often lead to misinterpretation of the tree´s real size and its surroundings.